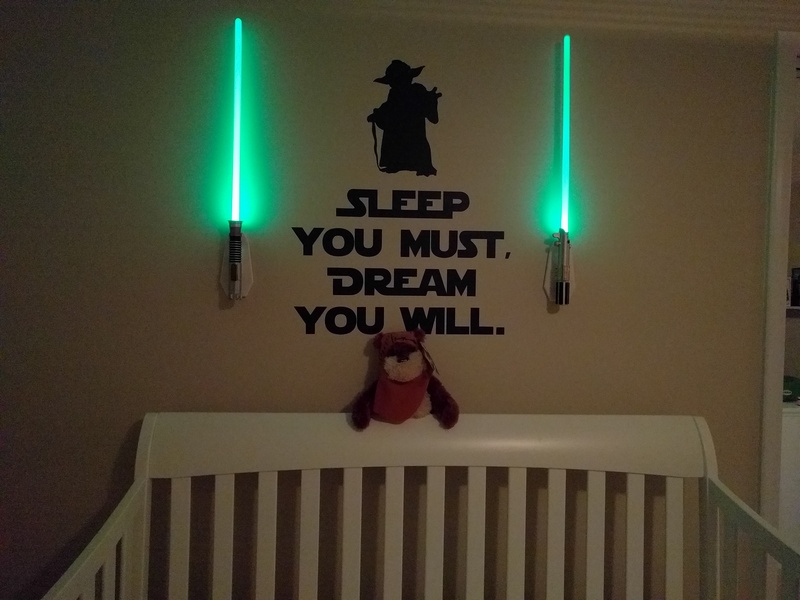 Back before Lil’ G-Man was born, my ever-understanding wife and I had a discussion regarding the theme for his nursery. And by discussion, I mean that I said we were doing Star Wars. She had been thinking trains, The Hungry Caterpillar, etc., but none of that really mattered. We also weren’t 100% sure that we were going with the name Grayson and figured he could grow into a Batman room later. And again, by we, I obviously mean me. (see above regarding ever-understanding wife). An essential part of any baby’s nursery is a nightlight. And in the Star Wars universe, what better light is there than that from a lightsaber? Luckily, there’s a company called Uncle Milton that sells Star Wars projects (like the Jedi Force Levitator). And of course, they have a make-your-own lightsaber room light. It took the adults about 5 minutes to put together, but could be a fun project for a little one. Then a couple of nails and boom – the perfect nightlight for the nursery. It might not have been exactly what my wife was thinking, but seems legit to me. There’s a version that rotates between multiple colors and another version where you can buy either Luke’s, Obi-Wan’s or Darth Vader’s lightsaber. They both come with a remote as well and make some fun sound effects when turning on and off. Mission Accomplished by this dad! Previous SilverHawks Live Action Movie For 2018….Written by Jon Favreau?